Deterioration; change from a higher to a lower form, especially change of tissue to a lower or less functionally active form. When there is chemical change of the tissue itself, it is true degeneration; when the change consists in the deposit of abnormal matter in the tissues, it is infiltration. Fibroid degeneration is the Change of membranous tissue into fibrous tissue. Uterine fibroids, which are also called uterine leiomyomas, are non-cancerous tumors that arise in the smooth muscle of the wall of the uterus, cervix or ovary. Fibroids are the most common type of tumor that develops in the female reproductive system. Roughly 40 percent of women over the age of 40 develop a uterine fibroid, most women will not know that they have fibroids because they produce no symptoms and these fibroid tumors may remain symptom free or even degenerate on their own without the woman being the wiser about what is going on in her body. Degeneration is also known as necrosis (tissue death). When fibroid degeneration is mentioned, it usually represents a fibroid tumor that collapses on itself and either hardens or liquefies. This usually occurs because this benign tumor has outgrown its blood supply causing it to shrivel up and die which is also known as fibroid degeneration. A robust blood supply is important because it supplies oxygen to the fibroid tumors and just like all living tissue, fibroid tumors need oxygen in order to grow and thrive. Fibroid degeneration can also be due to low estrogen levels since fibroids seem to thrive in an estrogen dominant environment. Low estrogen levels are usually common during menopause. Hyaline degeneration is the most common type of fibroids degeneration that can occur in 60% of all fibroids cases. 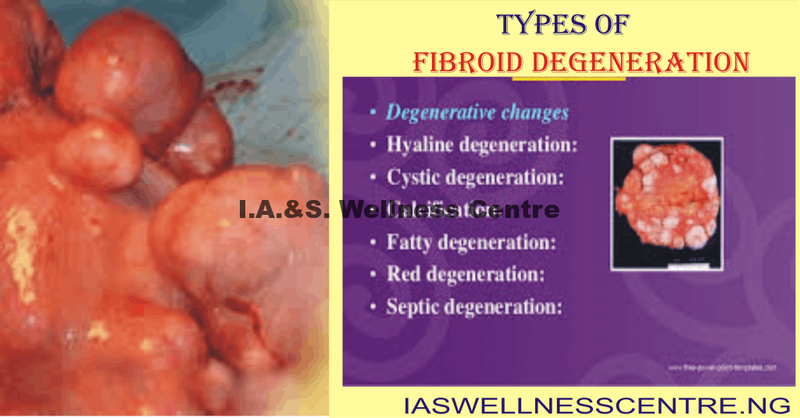 The most common change observed in fibroids that are undergoing this type of degeneration is replacement of the fibrous and muscle fibroid tissues with the hyaline tissue (type of connective tissue). Gradual decrease in the blood supply to the fibroids can cause this type of fibroids degeneration. Although, hyaline fibroids degeneration is without symptoms, it can cause central necrosis (death of the cells and tissues) and leave cystic spaces at the center. In this way, cystic fibroids degeneration starts. The other consequence of the hyaline degeneration is slow calcification of the fibroids. Cystic degeneration is not so common type of fibroids degeneration; it affects only 4% of all fibroids and usually occurs after menopause. As already mentioned, hyaline degeneration often precedes cystic degeneration. Decreased blood supply to the fibroid may influence liquefaction of hyalinized areas that are seen as cystic changes on the ultrasound. They resemble “honeycomb pattern”, and sometimes can be misleading, especially with the submucous type of fibroids. They are often misdiagnosed as other gestational abnormalities, such as missed abortion, blighted ovum, and hydatidiform mole. This type of fibroids degeneration is not as common, though some doctors think that myxoid degeneration is present in, as much as, 50% of all fibroids. This type of fibroids degeneration is common during pregnancy or after pregnancy. It is a well-known complication especially during pregnancy. Red degeneration occurs in 8% of fibroids complicating pregnancy, although the prevalence is about 3% of all uterine leiomyoma. Red fibroids degeneration is the hemorrhagic infraction of uterine fibroids. The exact mechanism of red degeneration is not completely understood, but scientists believe that it begins with the venous obstruction at the periphery of the lesion, which leads to hemorrhagic infarction and extensive necrosis that involves the entire lesion. Red degeneration usually begins around 20 weeks and the pain can vary from no pain to severe pain around the fibroid as well as the lower back. There may also experience some light bleeding as well as a mild fever, vomiting and nausea. Red fibroids degeneration affects half of the fibroids during pregnancy; it’s quite common. Fibroids during pregnancy have the tendency to rapidly grow, because of the higher levels of estrogen. They soon overgrow their blood supply and start to decay. The symptoms characteristic for the red fibroids degeneration may include abdominal pain, tenderness localized to the uterus associated with mild pyrexia and increased white blood cells count (leukocytosis). If you are pregnant with fibroids and experiencing some of those symptoms, don’t worry; they are resoled over a few days and any treatment is rarely necessary. Pain is the most frequent sign of uterine fibroid degeneration. The process of degeneration usually begins when the fibroid grows so large that the nearby blood vessels can no longer supply it with oxygen and nutrients. As the cells of the fibroid die, they are often replaced by collagen, the semi-rigid substance found in joints, the ears and the tip of the nose. This type of degeneration is called hyaline degeneration. The pain is often severe and localized to the site of the fibroid, usually somewhere in the pelvic area. The severe pain associated with fibroid degeneration often lasts for two to four weeks. In certain causes, the pain may not disappear after two to four weeks, resulting in chronic pelvic pain, which is also usually localized to the site of the fibroid. However, the chronic pain is generally less severe than the acute pain. A fibroid can undergo a different type of degeneration known as red degeneration, or necrobiosis. This type of degeneration typically occurs during pregnancy. In addition to pelvic pain, red degeneration may cause a low-grade fever and a temporary elevation in white blood cell count. In some rare cases, a degenerating uterine fibroid may cause hemorrhage or bleeding. In these cases, the degeneration is called a corneous degeneration. The bleeding can also result in a drop in hemoglobin levels.No matter how severe the pain is, it is not life threatening. Once the degeneration is complete, any pain or fever usually goes away. NOTE: Fibroid can degenerate at any time whenever the fibroid tumor is deprived of oxygen which can be during perimenopause, menopause and even during pregnancy (known as red degeneration). Red degeneration is a common complication associated with fibroids during pregnancy. When the degeneration is severe in pregnant women, it can cause hemorrhage, preterm labor, etc, although these occurrences are usually rare. Red degeneration will not harm the fetus.One of the best ways to help shrink fibroids naturally which may also lead to fibroid degeneration is by balancing your hormones and preventing a state of estrogen dominance. RESEARCH INTO NATURAL MEDICINE HAS DISCOVERED NATURAL HERBS THAT CAN TREAT FIBROID WITHOUT EXPOSING YOU TO NEGATIVE SIDE EFFECT. 1- Come to our office if you are in Lagos. 2- You pay to the company’s account and the kit will be sent to you between 24-48 hours within Nigeria. And it takes 5-10 working days for international delivery. Free of charge delivery nationwide (If you want us to send the kit to you any where you are in Nigeria, you will get it between 24-48hours ,at most 72 hours). We use transport companies such as: ABC transport, GUBA express, Young Shall Grow, Agofure Motors, Okeyson Motors etc from Lagos to various states in Nigeria. N.B: International delivery will only enjoys 50% discount of the delivery cost (50:50). At I. A. & S. Wellness Centre, we have well trained staff members to guide you. This entry was posted in Health articles and tagged abdominal pain, bloating, constipation, degeneration, depression, female fertility, female infertility, fibroid, hormonal imbalance, inflammation, menstration, Natural cure.